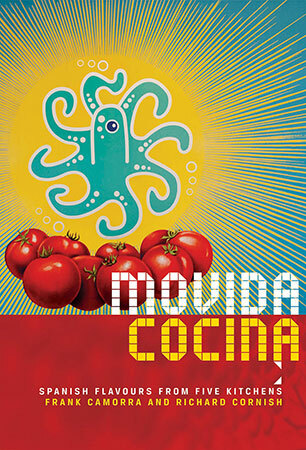 An inspiring collection of contemporary Spanish recipes from Australia's renowned MoVida restuarants. Feel the pulse of its thriving tapas bars, watch the speed and grace of its wait staff, inhale the aroma of sizzling chorizo and savour the salty sweetness of crayfish straight off the grill. From its flagship restaurant in Melbourne's Hosier Lane, to the opening of its latest venture Pulpo, MoVida has always embodied the heart and soul of Spanish cuisine. By fusing local and international flavours and pushing culinary boundaries, the MoVida restaurants have irrevocably changed the landscape of Australian dining. MoVida Cocina gives you a closer look at the people, venues and dishes that have made the MoVida bars and restaurants what they are today. Acclaimed chef and owner Frank Camorra takes us behind-the-scenes to reveal special techniques, signature dishes and the pure joy of cooking that infuses his life and work. He also reveals 70 stunning new recipes, including his chorizo-filled fried potato bombs, which featured in a nail-biting episode of 'MasterChef Australia' in 2010. Frank Camorra was born in Barcelona and spent his first five years in Andalucia, before his parents migrated to Australia. In 2000, Frank travelled throughout Spain and was inspired by both the modern and traditional aspects of Spanish cuisine. At his restaurant, MoVida, Frank was determined to share his discoveries and bring the tastes of his homeland to his adopted country. Richard Cornish is a television producer, food writer and sausage expert. He writes about the connection between the land, producer, chef and consumer and its significance to food diversity and taste.